After 2 days of digging and our first County inspection, the concrete footers for our garage foundation were poured today. The current plan is to push ahead with the garage while the new house basement is being dug, poured and underpinned. I would imagine the garage will be essentially done and sealed in in a month or so. A lot of progress has been made with digging our foundation and, barring major difficulty, should be done by tomorrow. After that the tedious foundation underpinning process begins. 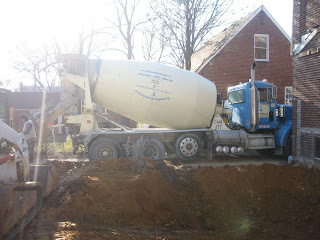 This is a complex process where the dirt under the existing foundation is dug out in sections and then filled in with concrete footers, and then the in-between sections are dug out and filled in. The goal is to support the existing foundation and house walls even though the new basement will be deeper than the existing (so we can have 8 foot ceilings down there). Jim and my father did a lot of work today on cleaning out the old house of pretty much anything we want to be sure to save including original glass door knobs, light fixtures, and our almost new carpet runner. Tomorrow they will clear out our attic so the interior demolition can begin on Monday. A major perk of moving out early is that the work on the inside of the house can get started much earlier than it would if we were living there. Now let's just hope that it all gets finished earlier as well (I'm not holding my breath). And the weather forecast for this week... generally dry except for a slight chance of rain on Tuesday and Thursday.